The aerial campfire, how birth order affects you, Rubik’s Cube in 20 moves, and the fastest pastor in Redwood Falls. 1) It’s going to be another one of those days. We awoke to heavy rain, lightning, and thunder and we’re going to get more later this afternoon, meteorologist Paul Huttner says. Twitter reports about two inches of rain fell in just an hour or so in Kenyon. There was about 3 inches over the same time just over the border in Wisconsin. 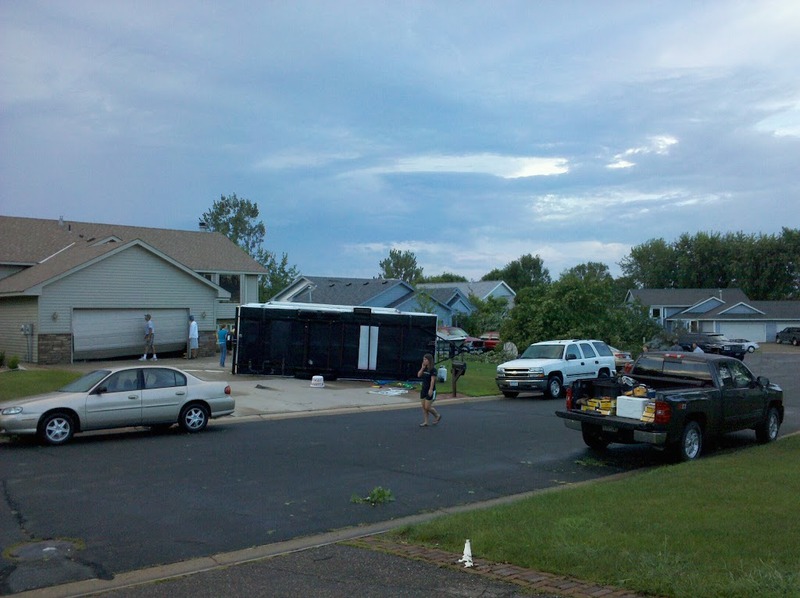 Take a picture or two of the weather in your area and send it to me (Check out this damage in Farmington). Weather has a magnetic quality to it, it draws us to pick up a camera. Lightning, in particular, is like a campfire. We love to stare at it. For hours. Here’s some images via Flickr of last night’s storms in Minnesota (along with some images from earlier in the week). This video from Heron Lake holds another truism: We’ve got the best clouds in the world. But as I listened to the rain this morning, I couldn’t help but think of the memorial on White Bear Ave., to Arianna Tatum, who jumped to her death on Wednesday. I wrote about it last night. All of those beautiful thoughts, wiped away by the rain. 2) I think every parent who has more than one child knows this is true. How about you? Researchers have revealed the results of a study into how the order of birth affects a person’s personality and character. First-borns received higher tests scores, in math and verbal ability, while later born children had better grade point averages in English and math. In a second experiment researchers looked at differences in personality between 76 pairs of siblings in high school. Subjects rated themselves on a series of statements designed to assess personality. Later born siblings were found to be more extroverted (sociable, outgoing), sentimental, forgiving and open to new experiences than their older siblings. First-borns were found to be more perfectionistic than their younger siblings. 3) Breaking news: There are 43,252,003,274,489,856,000 possible positions on a Rubik’s Cube. It can be solved in 20 moves. 4) The race to be the fastest pastor at the Redwood Speedway in Redwood Falls came down to two pastors but just one working car. “Christian love goes out the window when we get behind the wheel,” one said. In the end, it was decided by a voice vote and one pastor got the coveted trophy. “It’s a nice trophy. You could use it for baptisms,” one said. 5) Typical Minnesota. We’ve developed another young, promising player and then shipped him off to California to become a big star. A new national study says day care center costs for an infant exceeds college tuition in 40 states. Minnesota ranks third on the list of least affordable states for full-time child care. Are you getting your money’s worth when it comes to child care? I will have a News Cut Quiz this afternoon. Start reading old posts. Midmorning (9-11 a.m.) – First hour: Forty wealthy families have joined Bill Gates and Warren Buffett in a pledge to give at least half their wealth to charity. But will the money be given wisely, and will the idea of generosity spread? Second hour: President Obama galvanized his voters during the presidential elections using the Internet and social media like Facebook and Twitter. Can social media really swing a vote and win over the hearts of voters, or does it preach to the choir? Second hour: Norman Corwin’s radio drama about V-J Day. the Nissan Leaf, two mass-market, plug-in electric cars with very different technologies under the hood. Are they game changers or just expensive toys? Second hour: A discussion about new research that says our ancient ancestors may have been eating meat long before we thought. All Things Considered (3-6:30 p.m.) – Chicago-based composer Ryan Ingebritsen recently received a McKnight grant to work on a project he calls, “Song Path.” Ingebritsen, a Bloomington native, is coming back to his home state to conduct the forest on hikes through Banning State Park and Whitewater State Park in August and September. After people sign up for one of his hikes through the DNR, Ingebritsen will lead them on a listening intensive hike highlighting how different natural sounds change throughout. He will also have musicians hidden along the path (drums, flutes, and various noise makers) who will be creating sounds to blend in with the environment. Marc Sanchez will have the story. I’m going to miss Sanden. I remember when he and Jeff were doing in the Loop…and now look at him. Big Star to be indeed. I haven’t been further than my raingauge this morning to notice any damage but there was 3.9″ of rain in my Apple Valley raingauge. So both first-borns and later-borns are good at math? One’s better at talking, while another is better at English? Weak study. I’m not buyin’ it. Re: 2), this was completely untrue in my family. I am the third child, and I am far more introverted than either of my two older sisters. I’m also way better at math, science, and English than they are. Re: 3), back when I was at OSU, I took a 15-minute bus ride from downtown Columbus to my dorm. There was a girl, who looked to be about 10-11 years old, playing with a Rubik’s cube. She would solve it in less than two minutes, randomly hand it off to another passenger to mess up, solve it again, hand it off, etc. She did this at least six times while I was riding. I used to be able to solve it, but it took me hours, so I was impressed. Whenever I’ve read a study saying birth order is related to personality I’ve always found that I am the exception. I’m horrible at math, no where near a perfectionist, and outgoing. I agree with you, Bob, that it depends on the parents. \\A new national study says day care center costs for an infant exceeds college tuition in 40 states. My response when people would be really concerned about affording college for my kids was exactly that point. If I can afford child care early in my career college shouldn’t be that bad when I’m making more later. And Tyler, the math statement struck my as a little odd too. I reconciled it though by thinking about my own kids. My oldest is really quick at math and understands concepts easily. She would probably score well on a single aptitude test, but proabably wouldn’t care as much about her grade over the course of a school year. She would likely not put in the long term effort or daily attention to detail to get the best grade. My youngest is a people pleaser. She would be really concerned about getting the A and would study very hard to impress me and the teacher. Her GPA will be good, but her raw ability and innate understanding of the concepts as measured by an aptitude test might not be as high.